(Verso) wet stamp in black ink, at left center: "PHOTOGRAPH BY / DOROTHEA LANGE / 1163 EUCLID AVENUE / BERKELEY / CALIFORNIA"
Dedicated to using the camera toward social ends, Lange spent several years documenting Depression-era conditions. 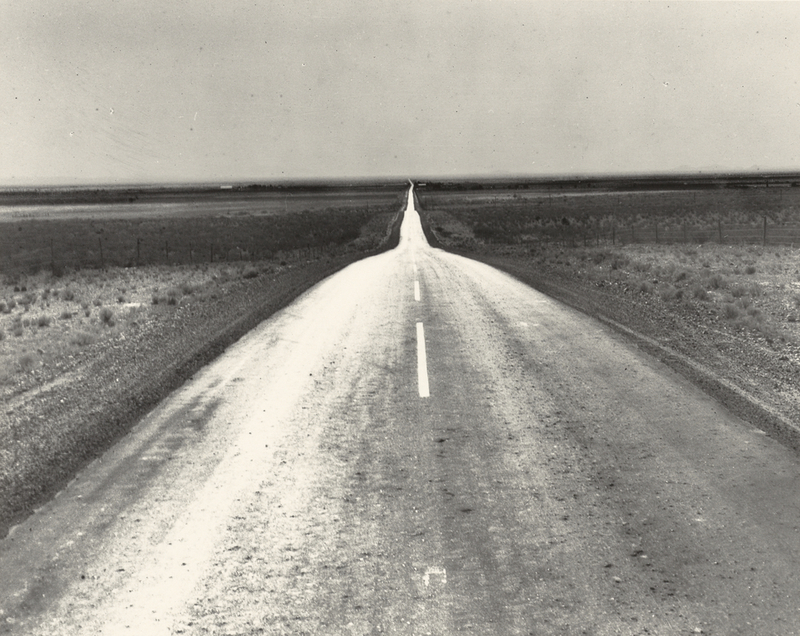 In her efforts to record the effects of the economic decline on migrant labor, Lange here focused on a western expanse dominated by Highway 54. Stretching deep into the distance through a seemingly desolate landscape, the road was one that many families took west on their exodus from rural dust bowl conditions in Oklahoma. Lesson in which students compare images of a highway, write compositions, and use one-point perspective in landscapes.